Between an unpredictable hurricane season, windy winters, and burning hot summer days, it can be a challenge to plan outdoor events in Florida. But a reliable plan is all you need for success! Find out how you can be prepared for anything. Have water readily available in multiple locations. Set up sunscreen stands for purchase and application. Be sure there is enough shade for everyone attending. If you have a speaker or musical act taking center stage, consider providing free sunglasses (which will be great publicity after the event), or moving that to the evening time. Install misting fans throughout the event to keep your audience cool and refreshed. You can offer handheld misting fans available for purchase as well. If your event has games, throw in a few water-themed activities. This is another chance to give your audience some free swag such as an event towel or dry T-shirt. Have umbrella and plastic coat stands available for purchase. If your event is outside and in a now-muddy area, throw hay onto the sludge to absorb moisture and make walking easier. Be sure that all attractions have tents with pointed ceilings to redirect the water. If your event is inside and people are escaping the rain, have umbrella bags available and floor mats around the entrance. Have weights and clips ready to hold loose items down to heavy furniture. Double check tent pegs and tighten up flaps to prevent them from whipping around. Consider setting up wind-breaking fabric walls around your event. Have hair ties and headbands available at the nurse station, and set up signs so people know where to find them. Have heated lamps positioned around the venue. Set up games which require more activity and movement, and set up a fire for warmth (and roasting marshmallows) as well. Consider blankets as a purchasable item or game prize. Make sure hot beverages are available. Any weather can be conquered if you take enough precautions. The Orlando event management team at Fun Planners wants to go the extra mile to ensure your event is a success. Contact us online or call at 407-995-4949 to learn how we can help! If you’re new to the world of Orlando event management, planning a budget can be intimidating. But it doesn’t have to be! With these suggestions, you can stay relaxed, on deadline, and under budget. Finances aren’t fun, and you might feel tempted to put off creating a budget. But it needs to be one of the very first things that you do! It determines every step forward. Record the budgeted expense versus the actual expense. Break down every single item in your budget; don’t lump items together. While certain categories might make sense to group together now, it could get complicated later on if you need to make changes. The more details you record, the more accurate your budget is. If anything goes wrong, it’ll be easier to explain with details, and it’ll be easier to recycle your budget for similar events! A single surprise item can make the difference between being over and under budget. Add a column to your spreadsheet where you can write down any miscellaneous information, especially if your budget needs to be approved by someone who isn’t directly involved in the process and doesn’t understand why certain items are budgeted for. Look into similar events to understand the finances. Historical data will help get your estimated costs closer to your actual costs. While your budget might look nicer if you underprice an item, it will only lead to losing money in the long run. Many vendors are happy to provide estimates. Offer as many details about your event as possible, and make sure that the vendor gives you a comprehensive breakdown so you know the price of gratuities, service fees, or tax. While it’s time-consuming to research a variety of venues, caterers, photographers, videographers, and AV companies, this can save a significant amount of money. Compare every option thoroughly before deciding. Build in 15-20% of your budget for plan B. Think about the worst case scenarios for your event — everything from a complete cancellation to a change in the weather — and plan accordingly. Resist the temptation to use this financial cushion to add luxury; only use it for emergencies. When you work in Orlando event management, you spend a lot of time working with your budget. With these tips, you can plan and follow budgets with confidence! To find out how we can help make your next event memorable, contact us at 407-955-4949. Planning an event is one thing, but gathering attendees to come out and support it is another; without attendees, your event has no value! Strategic marketing is key to raising awareness. By using social media platforms to your advantage, your event can quickly become a success! Create an event page on Facebook that includes all the details about your event’s date, time, and location. Through this page, you can monitor audience engagement and interest, as well as provide a space for conversation about the event. It makes it easy for you to respond to questions (and for attendees to answer each other’s questions as well). By seeing which questions are asked often, you can understand what information is being poorly communicated and rectify it. Facebook event pages are also an excellent place to post any updates! Did the venue change? Post it. Did the times change? Post it. Is there important weather information that’s going to affect activities? Post it. Facebook events are easy for your attendees to share with their friends, meaning that you benefit from free, word-of-mouth marketing. Posting pictures is an easy way to get your attendees excited. Take pictures of the venue, decorations, catering, prizes, guest speakers, and more. With Instagram’s story feature, you can document and share day-by-day updates without clogging up your feed; and you can even save these stories in your highlight reel. Show the people who weren’t able to attend what they’re missing! LinkedIn allows you to market your event to professionals in your network. Leading up to your event, post updates and important information to your company’s page. Each time you post an update, it will appear on your subscribers’ newsfeed. It’s important to remember that most professionals scrolling through LinkedIn are looking for information, advice, or opportunities, so you want to make sure that you’re marketing the event to your audience. Show them how they can benefit from attending your event. With these few strategies, it’s easy to use social media for your Orlando event management. Give us a call today to find out how we can partner with you to take your event to the next level! The day of your event is finally here. The flowers are beautifully coordinated, the catering company came an hour early (at no extra cost), and there isn’t a napkin out of place. Everything looks perfect, and you breathe a sigh of relief. But little do you know that in an hour, the conference speaker is going to show up with spinach stuck in her teeth. Your assistant is going to complain about a massive headache, the guest of honor will spill pasta sauce all over her shirt, and your heels will be bloody and raw from the back of your shoes. Luckily, your trusty emergency kit is going to get you through! You can’t rely on a solid internet connection. Plan to have any important music or presentations backed up on a flash drive! You can’t go wrong with duct tape and clear, double-sided tape. Gaffer’s tape is great as well; while it’s more expensive than duct tape, it can be used to secure loose cables to stage floors, podiums, and other surfaces for safety or concealment. No one wants to leave an event with a sunburn. Pack extra sunscreen and encourage your staff to do the same! You never know when you’re going to need a last-minute sign! Prepare by packing your own chalkboards and brightly colored chalk. It goes without saying that you’ll need your phone for everything from emergencies to last-minute schedule changes, but if your phone dies, that’s going to be nearly impossible. Bring both an iPhone charger and an Android charger, just in case. Don’t leave for a long day at an event without Ibuprofen, band-aids, gauze, tweezers, and hand sanitizer gel. Whether you’re looking to label staff members’ phone chargers or scrambling to find pens to leave at the name tag table, a Sharpie will always come in handy. Wireless mics tend to fail just at the moment you need them, so plan ahead by bringing your own handheld microphone. Handheld mics are particularly helpful when your entertainment is stationary and won’t get tangled in a cord! No one wants to walk around sporting unsightly stains. Save your crew and attendees (or even yourself) from embarrassment by packing a stain removal pen. This is especially important for an outdoor event! Make sure to be proactive and pack Benadryl and bug spray as well. If you work in Orlando event planning, this is a great list to help you start building your own emergency kit. Contact us today to find out how we can help you plan your next event! Trying to put together a perfect team for event management can be tricky. You don’t want too many people, you don’t want too few, and you need to make sure everyone is trustworthy and qualified. By investing time into finding and hiring your dream team, you’re investing in the success of your future event! Before diving into hiring your dream team and assigning roles, devise a plan. There should always be three things that are clearly laid out: hierarchy, expectations, and role definitions. Establish an official flow of communication and who bears which responsibilities. First, determine your team captain, and then identify who the head of each committee will be. The heads will report to the team captain. The team captain should be in charge of monitoring overall progress, managing deadlines, delegating tasks, and inspiring employees. Make sure this person has excellent time management and communication skills — they will be responsible for setting the tone and goals and supporting and encouraging the team. While your team captain should be driven by their vision, this team should be comprised of people driven by logistics. They’re responsible for tackling the details so that the event can come to life! These details include estimating attendance numbers, finding the perfect caterer, negotiating with venues, selecting speakers, and coordinating schedules. Consider putting together a team of no more than two! This lets them bounce ideas off each other without excessive collaboration. 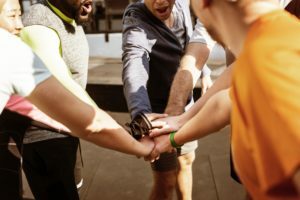 If you have a large event and don’t feel comfortable with a small number of program administrators, make sure you or your team captain is specific in assigning each member their responsibilities. Your on-floor team is invaluable. They oversee security, crowd management, and tech support. They set up, clean up, and tear down, and are the members of your team who will directly engage with event attendees. Make sure that they’re friendly, easy to talk with, and are prepared to answer attendees’ questions. It’s crucial that your finances are carefully planned and managed, and you want an intelligent, transparent team taking care of them. The treasury committee ensures that your budget is well-planned and monitored, and they help you get the most out of your budget and event. They search for sponsors and funding, set budgets for sub-committees, take care of payments, and determine the scope of the event. Your creative team is responsible for giving your event a consistent look and personality. After ensuring that they understand the event’s goals — and after they have a definitive budget — encourage them to let their imagination run wild. Remember, the head of the committee will have to run large ideas past the team captain! This team will manage everything from the floor layout to audience/media interactions to t-shirt and app designs. It can be a puzzle to piece together the Orlando event management dream team, but it’s worth it. Working with people you trust ensures your event’s success and gives you a piece of mind! To learn about how Fun Planners can help, contact us today. Coffee? Check. Clipboard? Check. More coffee? Check. An extra battery pack and your favorite black flats? Check. When it comes to being an event planner, these things are common, but there’s more to the job than coffee! These are the everyday signs that you’re definitely an event planner. When you wake up on event day and it’s sunny, you give a little cheer, regardless of whether your event is indoors or outdoors. Your wardrobe is basically all black. Your desk is drowning in past event swag. It’s impossible for you to attend an event as a guest and not make a million mental notes (or feel constant sympathy for the event organizer), and you have to resist the urge to lend a helping hand. You have notebooks in your car, by your bed, and at your desk. When you tell people your job title, you always cringe when they say, “That sounds fun!” Yes, it’s fun, they’re not wrong, but you’re not getting paid to party! Weekends? Holidays? What are those? A color-coded schedule gives you a thrill. Your friends and family gave up long ago on trying to surprise you with a spontaneous road trip. No one can multitask like you can. Growing up, you were always the party host. You have an emergency kit on hand at all times, and it contains everything from deodorant to nail polish remover to aspirin. Yes, it’s a random assortment, but every single item has saved the day at one point or another. The local coffee shop knows your name (and order) by heart. You’ve had a nightmare the night before an event. When you and your friends are going out for the night, everyone always looks to you for the plan and itinerary. You have a plan A, but that’s not all — you’re prepared all the way through plan Z. As a child, you always organized your toys. Once upon a time, when you were new to the industry, you wore your favorite heels to an event, but boy did you learn quickly. Now, you only wear shoes that can withstand at least 12 hours of constant walking (and let’s be honest, they’re black). You have about 50 to-do lists, and sometimes they end up all over the place. Your “vacation style” consists of detailed packing spreadsheets and a carefully planned itinerary. If someone tries to make plans with you, even if it’s months in advance, you have to check your calendar. You have a funny (and/or traumatizing) story about every venue within a 30-mile radius. It doesn’t matter what the mess is — you’re confident that you can fix it with duct tape. You’ve used past event swag as a last-minute gift. You feel naked without a clipboard and a headset. The week before an event, you check your weather app every five minutes. If anything goes wrong on vacation, everyone always looks to you for plan B. When your friends complain about their 9-5 work week, you resist the urge to point out how lucky they are to have a consistent schedule. You’ve developed a voice that sounds like you’re speaking into a megaphone, but you’re not; it’s your event voice. Does this sound like you? If so, don’t stress about Orlando event management — we can help. Contact us today online or at 407-955-4949. Thanks to streaming services like Netflix, the show “Parks and Recreation” continues to gain loyal followers. However, the real question is — which character has your event planning style? Take the quiz and find out! 1. How did you get started in event management? A) You’ve always been passionate about celebrating special events and bringing joy to those around you. Event planning was a natural choice! B) You discovered your hidden talent after working a variety of odd jobs. C) Ever since you were little, it’s been your dream to work as an event planner. D) You can’t remember what initially drove you to the world of event management. Although your friends were initially surprised by your choice, it didn’t take long for them to see your talent. E) You started as someone’s assistant. While you weren’t very interested at first, it became your passion, and you made it your career. 2. Centerpieces have been delivered, but they look nothing like what your client requested. What do you do? A) You’re extremely optimistic and easily calm down your client. Your partner handles the problem while you handle the client. B) No worries! Remind your client that their elegant event is perfectly memorable without the centerpieces; maybe they would have taken away from the other decorations. C) After a very brief moment of panic and frustration, you pull out your homemade backup centerpieces, which are actually more perfect than the originals. E) You’re beyond resourceful and assure your client that you can save the day just by running to the store down the road — you can recreate those centerpieces for an even better price. 3. You’re pitching a fundraiser idea to a new client. What’s your plan? A) You know that your enthusiasm for the project will drive the presentation. B) You like things that are flashy and glamorous, and you incorporate the latest technology into your presentation. C) You thrive when speaking in front of people, and can’t wait to demonstrate why your plan is the best option. You are fully prepared to answer any and all questions they throw your way. D) Your presentation is short and concise, and your confidence shines through. E) You keep your presentation simple, logical, and down to Earth. 4. Your client asks for a caterer recommendation. What do you suggest? A) A healthy, delicious banquet is never a bad choice. B) Always up on the trends, you suggest following the latest foodie trends, which you guarantee will catch the eye of every blogger and celebrity in attendance. C) You can’t help it — your instinct is to recommend breakfast food. You describe a lovely, sophisticated brunch. D) You believe strongly in offering guests the highest quality of food, and you start by suggesting an exemplary butcher. E) Every event should have a unique quality! You tell your client that they can make their event memorable through food, such as fondue or a themed, interactive display. 5. What do you like to do in your free time? A) Anything active and athletic! B) You’re all about your side hustle. You might have an Etsy, work at the local coffee house, or work as an Uber driver. C) Honestly, you love your job, and it’s hard to stop working in your free time. But you always like to spend time with your close friends! E) You love animals. On the weekends, you can often be found volunteering at the local animal shelter. Mostly As: You’re Chris! You’re cheerful and optimistic, and you have a gift for bringing peace and calm to chaos. Mostly Bs: You’re Tom! You love to keep up with trends in the event world, and you have a talent for planning luxurious, elegant affairs. Mostly Cs: You’re Leslie! You’re deeply passionate about what you do and fiercely loyal to your team. Mostly Ds: You’re Ron! You’re a private person and have high standards for your events. While many may mistake you as stern and stoic, you have a fun-loving side to you that comes out at your job. Mostly Es: You’re April! You’re resourceful and have a dry sense of humor. When you work on a project that you’re passionate about, you’re unstoppable. No matter which Parks and Recreation character you’re like, Orlando event management is easy when you work with the experts at Fun Planners. Contact us today to learn how we can make your next event one to remember! Now that you’ve chosen your seating arrangement, it’s time to decide: should you have assigned seats? This, of course, depends on the type of event, but more often than not, you should take the extra time to create a seating chart. Although science proves that assigned seating is preferable, benefits go beyond science! By assigning seats, you’re able to strategically plan where people will be sitting. You can connect people in the name of business, or you can make sure that someone coming alone is sitting at a kind, outgoing table. If there’s any sort of bad blood between guests, assigned seating is also an excellent way to prevent unnecessary drama; seat those guests on opposite sides of the room. Many people worry that by assigning seats, guests will interpret an otherwise relaxed event as rigid and formal. But this couldn’t be farther from the truth — open seating is chaotic and frustrating for your guests. Consider the social anxiety you may cause guests when they walk in and discover they now have to worry about being removed from their group, finding a seat amongst familiar faces (even if their goal is to mingle), and sitting at a table outside of their age group. A common misconception is that if you assign seats, guests will feel obligated to sit there all night long. However, once the formal portion of the evening is over, whether that’s dinner, an auction, or a presentation, your guests will move about the room. It’s an awkward experience to have guests wandering around, desperately hunting for an available seat. It’s awkward for the host; it’s awkward for your wandering guests; it’s awkward for your seated guests if they have to offer to split up their own party to satisfy another. This is horrible for you as the planner, as angry groups of people — who did not mean to linger for so long in the lobby — rush up to you and demand you assist them in the search for a seat. If you have invited a group of people to your event, no matter if it’s a business group or a family, it will be uncomfortable to watch them rush around and try to save a group of seats together — and it will be worse to watch their frustration if they can’t find those seats. This is especially true if you have planned an event where children are invited because it’s crucial that they are able to sit with their parents. Although it takes extra time and effort create a seating chart, it will be worth it! Assigned seating is just another way to save yourself day-of event headaches and stress. To learn more about how we can help you amidst planning Florida corporate events, contact us here or at 407-955-4949. Pros: This common style, where chairs are organized in consecutive straight rows, works well for large events of over 150-200 people. Space is optimized, so you will likely be able to fit more guests than expected, and every seat is frontward facing to guarantee an easy view of the stage. Cons: The audience is closed in, making it difficult for people to enter and exit rows. If you’re planning an event where you hope to incorporate audience interaction, this arrangement is not ideal, as it hinders communication amongst attendees. It will also be nearly impossible to serve any food or beverage. Pros: In this style, chairs and trestle tables are aligned in straight rows. Each table has about 1-3 participants, and you can group tables together. All of the seats are facing to the front of the room, meaning everyone gets a good view of the entertainment, and it’s easy to take notes or set up laptops. It’s also much simpler to both serve and consume any food or beverage! Cons: Depending on how many attendees you’re expecting, this style could also close in your audience, making it difficult for people to enter or exit rows without causing a disruption. The tables will reduce your seating capacity, and the audience cannot comfortably interact with each other. Pros: This round, dinner table style of seating is ideal for events where you’re encouraging audience interaction and participation! All audience members are fully facing each other. This is a great option for dinners, awards, weddings, or more informal events. Cons: Not everyone will be directly facing the front of the room. Where do you hope to direct the majority of your audience’s attention? Will there be a speaker or entertainment that they won’t be able to see as well, or will the speaker only command a small portion of the evening, with the rest left to small group discussion? Consider these things before choosing this style. Pros: Similar to banquet style, cabaret-style has an open end at each roundtable. The audience is seated in an arc facing inwards, and no one’s back is to the front of the room. Presentations or various forms of entertainment are more easily absorbed and enjoyed. Food and beverage are easily consumed. Cons: Consider the total number of attendees you’re expecting. This style is an inefficient use of floor space, as well as table space, since you’re not maximizing the number of chairs that could fit at each table. Are you struggling to choose a seating arrangement for your next event? Maybe you’re debating which colors to use, meeting with potential venues to narrow down your choices, or just learning how to better manage your Orlando event planning stress. We can help! Give us a call at 407-955-4949. Imagine that you’re attending a fancy event. Sharply dressed waiters circulate in perfect sync, serving cocktails and canapes while a jazz quartet harmonizes in the background. Are you surprised? Now, imagine that you’re attending an event and the host suddenly announces that the musical portion of the evening is about to begin — what musical portion? You can’t remember hearing about this. Suddenly, a marching band parades into the room, and their presence signifies something even bigger: all attendees are getting tickets to sit courtside at the next Magic game. Are you surprised now? As an event planner, it’s important to master the element of surprise! Whether these moments are big, small, or in between, keeping guests on their toes makes your event exciting and memorable. You don’t have to wait until the event begins to start surprising guests! The week leading up to your event, generate suspense. Send out daily emails with hints about guest speakers or entertainment, and offer limited time discount codes on your or an affiliate’s merchandise. Depending on your event, you could even provide clues about a scavenger hunt that will start the moment they walk in, and you can give even more clues about the prize or how to find their teammates. Your attendees are most likely assuming they’ll walk in, find their table, and take a seat. But you can create icebreakers that interrupt the normal flow of events! Your options are unlimited. You could design a tunnel walkway lined with balloons, build a wall where each guest grabs an envelope filled with a secret icebreaker question, or even set up a table where each guest is asked to choose silly, temporary tattoos for their wrists. People don’t usually think they’ll get anything for participating onstage as a volunteer. For the most part, guests expect to go on stage, get embarrassed, and then quickly exit. But this is a great opportunity to delight attendees (and encourage participation)! You can offer volunteers rewards that range from wine tastings to manicures to massages to free t-shirts to gift cards. Don’t disclose the full schedule. In fact, it’s best to put something on the schedule that’s not real, and then you can impress attendees with thrilling, unforeseen plans. Rather than only scheduling entertainment to perform at common times, surprise your guests with entertainment at unexpected moments. Hire fire breathers to entertain guests waiting for the valet to bring their cars around, or hire a magician to dazzle as they wait in lines. No matter what you need to surprise and amaze at your next event, the Orlando event planning experts at Fun Planners are here to help! Contact us today online or at 407-955-4949.